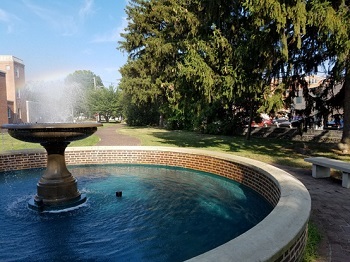 The Park of the Valiant is owned and maintained by the Chambersburg Electric Department but we would prefer that it is listed as a facility on your website; understanding it is an exception to the rule. You can keep listing as a Rec Dept facility.Here is my blurb about this facility: The Borough’s municipal electric utility has been diligently serving the power needs of our community for over 123 years. It’s hard to believe but Chambersburg has used its own electric generation systems ever since a generator and some street lighting were approved by its early council and installed in the early 1890’s. In 1904 however, there was a dispute over the new system’s financial viability and it was almost sold and taken over by the then pursuing utility growing around Chambersburg at the time. 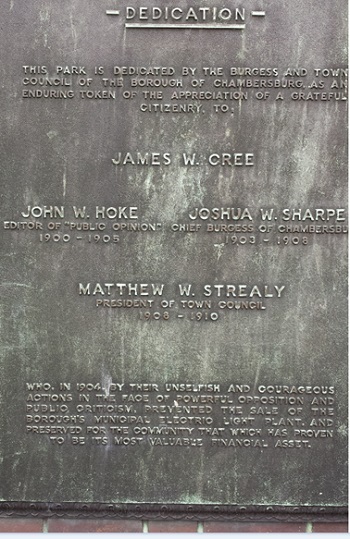 Thanks to some heroic and visionary individuals of the day the electric system was kept as a Borough asset. The “Park of the Valiant” bronze plaque on the entrance pillar and Fountain on Second Street, near the Headquarters Fire Station commemorates that day in history. Dissatisfied persons within the Borough sought to restrain the Borough from producing electricity in its very early years. Fortunately, the courts dismissed a legal challenge around 1904. The now named “Park of the Valiant” on 2nd Street near the Headquarters Fire Station was built in the 1938-1939 time period as a “floral park” and to commemorate the success in keeping local control of what turned out to be one of the Borough’s greatest financial assets. The fountain experienced major repairs by electric employees in 1993, and further improvements were made in 2012, and 2016. The deteriorated steps leading up to the Park of the Valiant from 2nd Street were replaced by an ADA ramp for greater access in 2017.